Going out to dinner in The States, my sister would roll her eyes when I would choose the restaurant because it would inevitably be a half hour’s drive away. They built a shopping center less than a mile from our house just as I was finishing high school, but I often chose to drive several towns away to eat. I do think the In-N-Out Burger in Pleasanton is better than the one in Union City. Same with the Chilli’s at the Fremont Hub. And I love to drive. But mostly I don’t like being stuck in the same place. With that mentality—and with a bunch of stuff to drop off at Cale and Sara’s—I hopped on my bike this morning and rode 40 minutes out to their place. 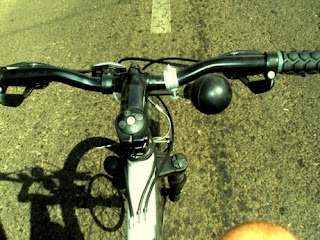 Biking on the opposite side of the road feels similar to driving on the opposite side of the road, except it’s inherently slower and easier to think ahead. That said, driving on the right all my life, my brain is programmed to equate the left side of the road with danger, and it always feels a little scary to manually override your brains warning signals. From an efficiency standpoint, switching sides is a zero-sum game. Intersections that used to be easy (i.e. 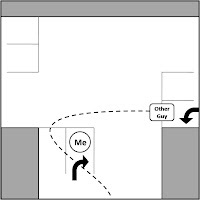 those where I’d normally turn right) are now difficult, but those I once loathed (i.e. those where I normally go left) are now a breeze. I maneuvered 2 roundabouts on the way out, the first of which seemed very easy, and the second of which—the one where I had to go 270° around the circle—made me a little queasy. Much of the ride was made easier because drivers are still quite cautious. At a few points during my ride, a car would match my speed. The additional speed bumps are easier for my bike to handle than for most cars. This made for awkward leap-frogging. I was less than 50 yards from Cale and Sara’s when two police officers standing on the side of the road motioned for me to pull over. They informed me there had been a road switch and that I needed to switch to the right side of the road. Now, any cyclist will tell you that bikes travel on the same side as cars. Sure, pedestrians are supposed to face oncoming traffic, but bikes flow with traffic. We had sessions on this during Peace Corps training, there are safety posters with such information hanging in classrooms at my school, this is pretty much how it works all over the world. But I didn’t feel like this was a teaching moment. So I said, “Okay.” When the police officer decided he was done, I turned my bike around and pedaled the rest of the way on the right side. Double switch! The way home was lousy, but only because of the wind. When I arrived back in Apia, I slid into a right-turn lane. A driver coming from the right turned to go through my side of the intersection, but he drove to my left (i.e. the right side of the street). He clearly saw me before he started the turn, and he was going slow enough that once I realized he was doing I was able to gesture to him to indicate he should be on the other side of me. I hope you’re proceeding with caution. Pictures below. Cale and Sara making bagels. 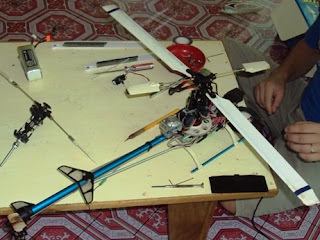 We also ventured over to JICA Tetsuya's house to help repair a remote control helicopter. Actually, Cale worked on the helicopter. I took a nap on Tetsuya's floor. I never roll my eyes. I don't know what you're talking about. You guys made those bagels? Yum. Miss me?! P.S. There is only one space after all my periods. You're worrying me. Stay away from the taxis. Regardless of country, they're all fricken crazy! Stay off the roads for a few days. Oka, se be careful! Keep up the blogging. 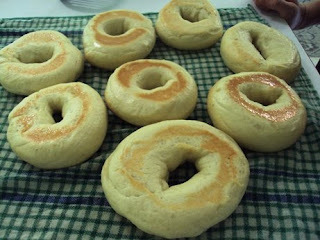 Can I get the recipe for the bagels? Road Switch drama! This is so not anticlimactic. 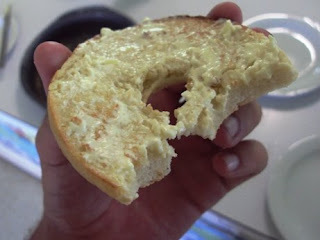 I want a butter bagel now. Mmmm. ridiculous, stupid idea for switching the road. Don't like that Prime Minister!